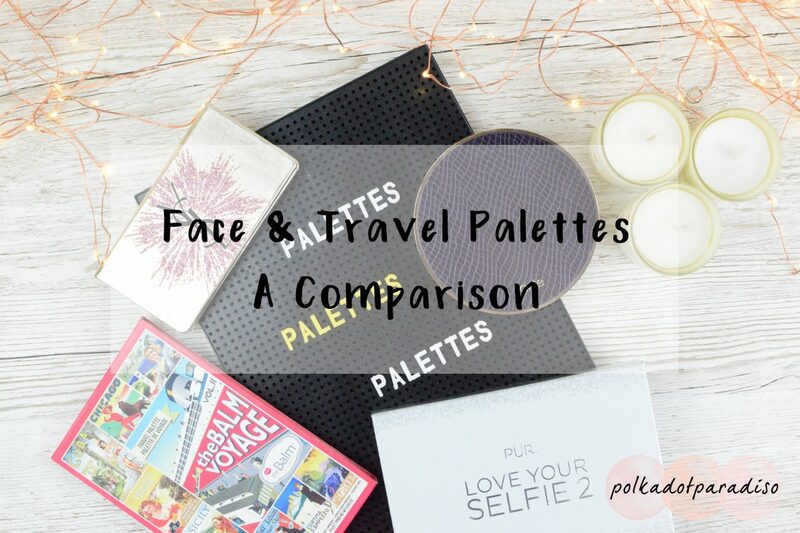 If you caught my PUR palette review recently, you’ll know I’m developing a collection of travel palettes. As I’m happy with pretty much everything else in my make up life, this is what I’m spending all my extra cash on instead. You might wonder why I’m even adding to my make up collection if I’m happy with it but as I travel fairly regularly to visit family or with work, I want to travel a bit lighter. Also, travel palettes are seriously cute and allow you to try the quality of a range of different products and brands, before committing to lots of full sizes. That’s my excuse anyway. As I’ve now got a collection of four, I figured it was time to do a little comparison post! I’m always on the lookout for more though, so drop me some suggestions in the comments below! This palette I briefly posted about in a first impressions post. It was part of a set that was an impulse purchase from QVC. It was also my first ever Tarte purchase. I hate the style of this palette. From the gold to the purple faux snakeskin it’s really not my style at all. If I judged a book by it’s cover I’d be ready to hide this at the back of my stash. Thankfully I’m not and this has had a good amount of use since purchase, and not just when travelling. This palette contains 6 eyeshadows, a bronzer, a highlight and a blush. In terms of being able to travel light, this is ideal – cutting down substantially on the number of products needed. Although I do find the overall size of the palette a little large. The shades are fantastic, they can easily take me from day to night. The slightly plum colour next to the light base colour is my go to daily shade now. The highlight and blush are both perfect shades on my skin (I’m very fair). The scent that I assume comes from the clay is really nice. My favourite bit about this palette though is how long it lasts on my skin. After applying a full face using this earlier today (14 hours ago to be precise) my blush, highlight and eyeshadow are all still in place. The eyeshadow colour has faded slightly but there’s no creases there yet. That is with Urban Decay Eye Primer underneath, as I always use that as standard due to oily lids. Other blushes in particular can fade away on my cheeks, so I’m super impressed that this one can last all day. Good value, you get a lot of product for your money. Great quality product that lasts all day. Has 3/4 items you would otherwise need to carry separately. Day and night shades of eyeshadow included. Quite bulky packaging, could be thinner and not so heavy. Design of the packaging won’t be to everyone’s tastes. From what I can see, only one set available and so if you have a darker skin tone, you’ll struggle with some of these colours. The palette does tarnish with very little use, particularly around the highlight. This palette is the one I’ve had the longest since I sadly disposed of my very old Dior palette. I think this was actually purchased with a holiday in mind and had been away with me for most trips up until late last year. The RRP of this is £39 but you can generally find it for around £30 if you shop around. It contains 9 eyeshadows, a highlight, bronzer, two blushes and two lip colours. That’s a lot of product in what is a reasonably sized palette. I love the fact that this contains lip colours. It really makes it a more complete palette. Obviously you can’t take the palette out and about to top up the lip colour, but I’m terrible at remembering to reapply anyway. There is a risk with lip creams in a palette with powders like this that the loose powder contaminates the lip colour. However, this palette is perfectly designed to have a separate cover for the lips. It doesn’t 100% protect it but as you’ll see from the picture below, there’s very little contamination. Given this is made from cardboard you’d think it wouldn’t be very hard wearing. However, after 18 months of ownership this has actually held up better than my Tarte palette which started to tarnish very quickly. In terms of the quality of the products, they’re okay. The eyeshadow doesn’t last all day. I can probably go to early afternoon before the folds start. The blush has a similar wear time. The most disappointing product though is the highlight. Given my all time favourite highlight is Cindy-Lou Manizer, the one in this palette is nowhere near as good. There’s just really no colour and not that much highlight to it at all. The lip colours last as long as you would expect for something creamy like this, not very long. Has a wide range of products, including lip colours. Thin packaging that’s easy to pack. Separate cover for lip colours. Could have more daytime eyeshadow shades. Products don’t last on the skin all day. I’m probably going to spend the least amount of time on this due to the fact I gave it a full review recently. While quite bulky, this palette has nearly everything. Except a blush. I’m still annoyed it doesn’t contain a blush. For £34 though you get a lot of product for your money – a mascara, lip crayon, lip gloss, 8 eyeshadows, highlight, setting powder and a bronzer. Unfortunately the downside to that is this is pretty huge and doesn’t actually fit in my current make up bag. The packaging itself also feels quite cheaply made with lots of cardboard and fading lettering on the outside. I like all the products in here (although I haven’t tried the mascara yet). The lip crayon and gloss are my favourites in particular. I use the gloss through the day and the crayon for an evening look as it’s a lot darker. This is another palette that has a great mix of day and night colours. Despite the size I’d be more than happy to take this away knowing there’s not that many extra products I’d need to take. Unfortunately, as with the YSL palette, this products don’t last all day. Just after lunch I can see the eyeshadow has folded and the highlight has all but disappeared. It’s so disappointing as this could have been my new favourite palette. Great range of items here for travelling slightly lighter. Lip products in particular are standout items. Packaging isn’t sturdy enough and is also too big. Colours don’t last anywhere near all day. Eyeshadows are very soft so the palette can get messy. When you’ve used the mascara, then what do you do with that space? This was an impulse choice while out shopping with my mother. I’ll be honest, I was drawn in by the beautiful packaging. At £43 this is one of the more expensive palettes I own. You can tell the increased quality level from the higher price point though, there’s been no tarnishing to the palette at all. It was also in a dinky case which I loved. Inside you’ll find four eyeshadows, one highlighter blush, two lip colours and three brushes. The brushes are a lovely addition and really handy aside from the blush brush, which is just way too small for me. This is definitely more of a night time palette. All four of the eyeshadow colours are bold and shimmery. In order to get a good pop of colour with the blush you have to apply quite a lot and so end up with a lot of highlight which is probably a bit bold for day time. The pink lip colour I haven’t used as pink isn’t my colour but the red is such a lovely colour on me I’ve been wearing it all the time – both day and night. I’ve been applying with the included lip brush and just love how it looks on me. It’s not too bold but is a lovely sweep of red on my lips. As you can see in the picture above I’ve been keeping the plastic that goes in between the palette and the lid. Because the powders are ultra soft, this palette has got very messy very quickly. It’s a good job that it’s mainly night time looks I’ve been creating with this as unfortunately the eye colour does not last at all, even with primer. I only really get a few hours out of this before the eye colours becomes just a line across my eyelid. If I’m just going away for a night and won’t be too bothered about my make up the next day this will definitely be going in my travel bag. Favourite colour swatch: no shade names given but it’s the top right colour. Lovely size and beautiful styling. Great selection of products and great that it also contains mini brushes to cut down on luggage even more. Nice colours, particularly for night time. Won’t last longer than a few hours. Blush brush is too small and could be removed altogether. It has to be the Tarte palette. If only it contained a couple of lip colours instead of the bronze it would be perfect. Oh and maybe if it had a more subtle design. As much as I don’t want to be recommending Tarte right now, thanks to their poor choices when it came to the Shape Tape Foundation, it is the palette I’ve been reaching for consistently both daily and for travel. Next time I travel it will definitely be the palette I take. Due to it’s small size though, if I’m away for longer than a night I know I’ll make room for the YSL palette too!